Talking About Family: Merry Commamas! 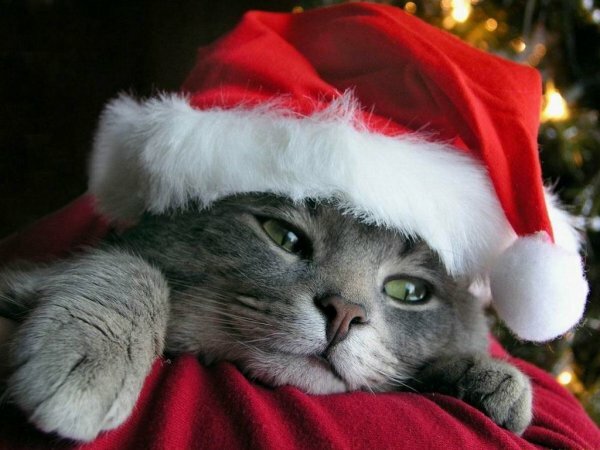 Grammar Cat loves the holidays. Our favorite part is visiting family. Unfortunately, some people aren’t so good with writing about their family afterward. So let’s do a quick review on how to talk about people, both individually and in groups. The cat rolled onto its back, like it always does, and tried to scratch my arm. The cat rolled onto its back and tried to scratch my arm. Now let’s consider nonessential information in respect to your family, because goodness knows holidays spent with the family can easily become a verbal onslaught of nonessential information. When talking about or introducing people, there is usually the component of nonessential information. Say you come from a large Italian family and you have a handful of Aunt Marias. How do you successfully relate to your mother which one of them has had too much eggnog and is hitting on the neighbor? Well, you could say, “Mom, Aunt Maria who has the drinking problem is hitting on the neighbor again,” assuming that there is only one Aunt Maria with a drinking problem. Because the “who has a drinking problem” is essential information to identify the exact Aunt Maria who is going to be a hot topic at the next HOA meeting, it doesn’t need to be set off by commas. But the situation can change in a way where a comma after “Maria” does become necessary. “Mom, Aunt Maria, who I already told you was a bad idea to invite, is passed out on the lawn.” This example assumes that Mom knows exactly which Maria is pulling the shenanigans, and the “who” clause is just a bit of rubbing in her face that you totally called Aunt Maria’s behavior. While gloating is nice, it’s nonessential information in that situation. This first example asserts that the speaker has only one brother, making the name of Will nonessential to identifying who this is (in this case, it’s also an appositive). It also allows for the cultural norm of Will only having one wife, and that wife is from New Jersey. This introduction implies a slightly different thing. First, it says that the name Will is essential to identifying which brother of the speaker’s is being referenced, meaning the speaker has more than one brother. Secondly, and most importantly, it implies that, while this wife of Will’s has made the journey from NJ, his other wives weren’t able to make it for the holidays. You have two cousin Freds, but one is in Iraq. Uncle Jerry spent three years in prison. You only have one sister and her name is Sally. You have a nephew whose name you can never remember. You only have one living grandma and she made your significant other the hideous sweater he or she is currently wearing. If the familial title is used in place of the person’s actual name, then it is capitalized. Why won’t Grandma stop petting her cat for one second? If Dad would just stop pestering Mom, we might have a pleasant meal for once. When the familial title appears before the name, it is capitalized. You see what Uncle Jim is doing over there? What a weirdo. I wish Grandpa Smith would stop spouting off racist things. When the familial title follows a possessive pronoun, do not capitalize. My dad says to take off the dress and stop your crying. Your aunt Maria sure does love eggnog. 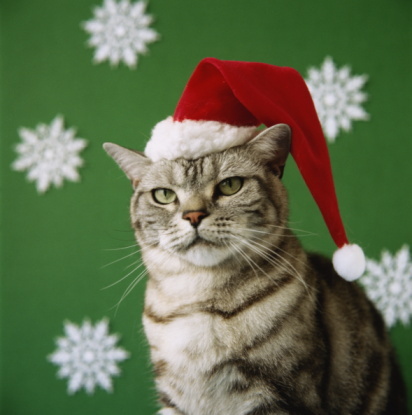 To celebrate the holidays, Grammar Cat will leave you with a slew of holiday cat pictures. 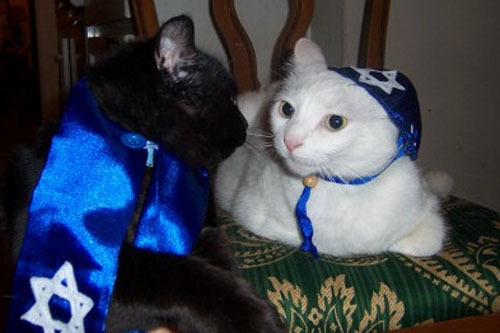 Sorry there aren’t more Kwanzaa cats. Blame the internet.